As a newlywed, I am still trying to add to my repertoire of meals. This week we had some rotisserie chicken leftovers, so I decided to try and squeeze another meal out of that first one. Do you ever do that? Cooking is such a creative process, for me it's like a puzzle. This time I had all the pieces! As with most of my recipes, this involved throwing a bunch of stuff and mixing it together: SUPER EASY! All of these amounts are suggested, but really you can add as much or as little of what you have and make it your own style. 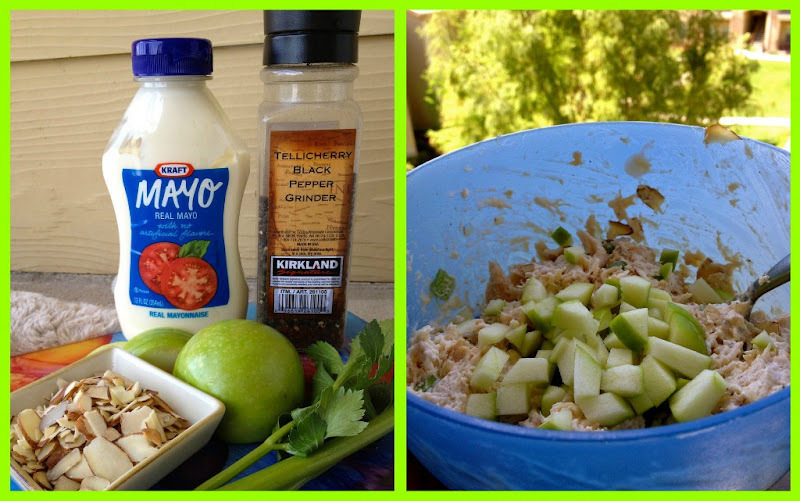 Basically mix all of these ingredients together and add mayo to taste. I added a little spoonful of sour cream for a little more moisture. And there you have it! It makes for a quick lunch preparation. I think it took me about 15 minutes total. That looks delicious. I love chicken salad sandwiches. I usually go the easy way and use can chicken, but now I've got to try out your recipe. And, I love the view by the pool. YUM .... It ALL looks delish! Soooo yummy! 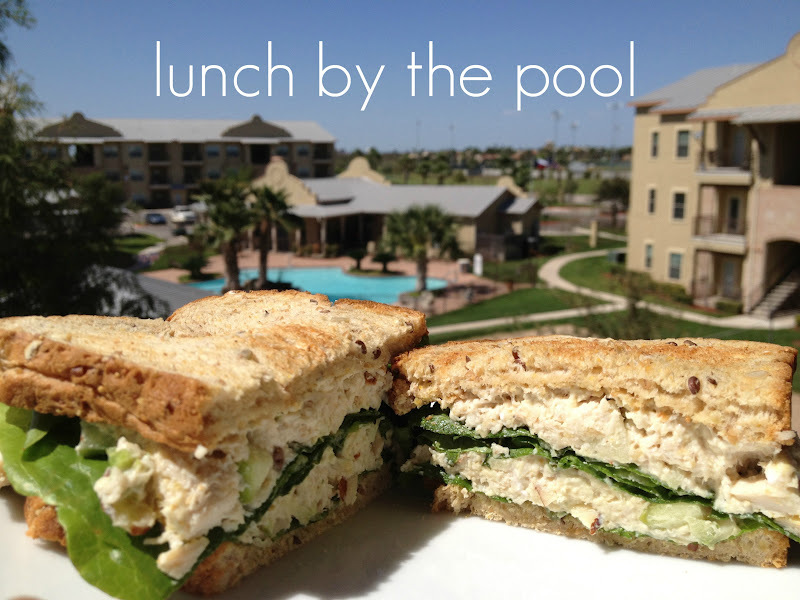 I would love to sit by the pool and eat these sandwiches! But here it is just too cold to sit outside yet...only 5°Celsius. Looks delicious! And I love that photo--great shot! nice photos, and it looks delicious. i like the addition of curry powder (of course!) and apples. yes, i always squeeze out one more meal if there are leftovers. rottiserie leftovers w/ apple, celery and raisens are my fav mix. have you ever tried the mayo made with olive oil? i have started using it, and its very good. looks like a nice lunch break! I did the same exact thing last week with my leftover chicken and then I made chicken stock with the rest of it. I used some fresh oregano in my chicken salad and it was actually pretty tasty that way!